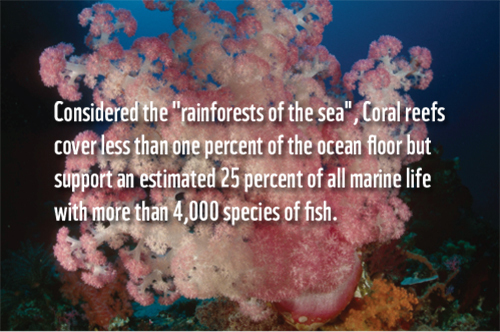 Coral reefs are considered one of the most diverse and valuable types of ecosystems on the planet. 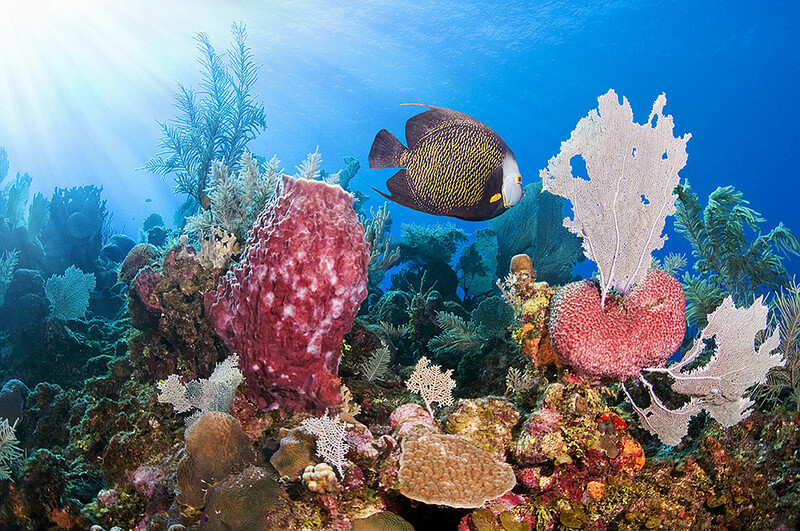 The Mesoamerican Reef (MAR) stretches over 1000 km from Isla Contoy at the tip of the Yucatán Peninsula down to Belize, Guatemala and the Bay Islands of Honduras and is home to 65 hard coral species. Coral reefs help protect coastlines from the damaging effects of waves and tropical storms, and they provide both shelter and habitat for a host of marine animals and organisms. Coral reefs attract thousands of divers every year who snorkel and scuba dive to appreciate the vast beautify and diversity of the MAR system. In addition to minimizing land-based threats, WWF is working directly in the marine environment to protect coral reefs and make them more resilient to the effects of climate change. 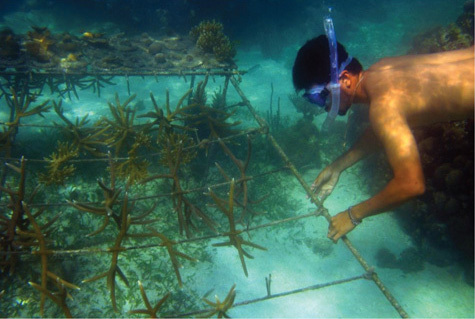 WWF is helping to create and strengthen marine protected areas (MPAs); restoring and building resilience into the reef using coral nurseries; and, in partnership with other organizations such as EcoMAR, training local fishers and tourists how to monitor coral reef health as they dive for work and for fun. The MAR provides food and income to hundreds of thousands of fishers every day. Yet many near-shore fisheries lack effective management or regulations, so fishers compete to catch as much as they can, with little thoughts of tomorrow. In order to feed their families, they must often turn to destructive or unsustainable fishing practices that have the potential to disrupt or destroy entire coral reef communities. Runoff with excess nutrients from agricultural fertilizers can increase algal growth on reefs, crowding out corals and hurting the ecosystem. Runoff can also contaminate reef ecosystems with pollutants such as petroleum products, pesticides and liquid and solid household wastes. Deforestation and coastal developments increase the amount of sediment that is carried by rivers and tributaries into the MAR. These sediments settle on the corals, suffocating them and diminishing their ability to feed and reproduce. Tourism is a key economic driver in the Mesoamerican reef. Thousands of visitors snorkel and dive to appreciate the MAR’s pristine reef system. However, coastal development for tourism increases waste and contamination overstressing sanitation systems. This threatens the very ecosystems that the visitors come to see and the livelihoods of millions of people who work in the tourism industry. Rising ocean temperatures and acidification of the ocean caused by higher concentrations of carbon dioxide in the atmosphere are leading to wide-scale coral “bleaching” and disrupting the entire reef ecosystem. In 1998, a coral bleaching episode destroyed 80% of live corals on some reefs in Belize. Some scientists fear coral reefs will disappear entirely by 2015. • Practice responsible diving and snorkeling. • Do not purchase souvenirs and jewelry made of coral. • Support eco-friendly resorts in coastal zones.